Type of wine: Light, dry white. 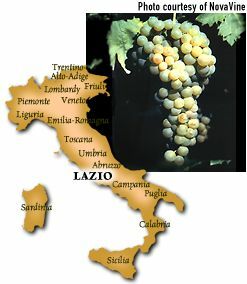 Origin: The most widely planted white grape throughout Italy due to high yields and fairly neutral flavors. Although Trebbiano is the basis for many simple table wines, it can be much more in the hands of a zealous winemaker. Its best renditions are those blended with Malvasia Bianca in EST!EST!EST! di MONTEFIASCONE and FRASCATI produced in the province of Lazio. Trebbiano is better known as 'Saint Emilion' in California, where it resides mostly in the hot Central Valley. Few grapes can or would admit to being the source of as many generic wines as this Italian native. Known as Ugni Blanc throughout much of France, the grape is again called Saint Emilion in the French sub-region of Charentes, where it is the most useful in distilled products such as Cognac. Trebbianos global reach stems from its highly-productive nature and its ability to ripen easily. Beyond that, Trebbiano is afforded little respect for the quality of the wines it produces. Description: Very pale in color with crisp citric tones and a refreshing, clean fruit with an attractive almond-like bitter note in the finish. Aging: Don't be silly! Trebbiano is a quaffer meant to be enjoyed immediately. Best location: Bright sunny hillsides with well-drained soils, warm-to-hot days and cool-to-cold nights. FastFoodFacts: Refreshing for cocktailing and with light, uncomplicated dishes. Light pastas and poached fish are very good companions.